Intelligent design, quality construction, and innovative software make Priority Command the best value in emergency traffic signal preemption available today. The Priority Command vehicle transmitter installs quickly and easily in any emergency vehicle using standard mobile radio mounting hardware. No calibration is required; just set one DIP switch for the vehicle's priority level, and it's plug and play. The transmitter is activated whenever the vehicle's lightbar is in use. It uses 12-channel WAAS-enabled GPS to track the vehicle's location, speed, and heading. This information is encrypted and then transmitted using proven, reliable 900 MHz spread spectrum frequency-shift-keyed digital data radio. Drivers have two large tactile-click rocker switchesone to activate or deactivate the transmission regardless of whether the lightbar is in use, and a second switch to select extended-range four-way-red preemption. This feature is primarily intended for police pursuits. When activated, it signals the intersection receiver to increase the preemption distance by 50% and to turn the traffic signals red in all directions. One bicolor red-green LED indicates power and the status of the GPS signal; a green LED blinks whenever the unit is transmitting; and a red LED blinks whenever 4-way-red preemption is enabled. Size: 5" x 3.5" x 1.5"
Mounting hardware Recessed 6mm x 1mm threaded brass insert on each side of case. Accommodates machine screws (included) or quick-release knobs (optional). Numerous configurations available including dual-band integrated. Antenna mounts (sold separately) Numerous options available including through-hole, bracket, trunk-lip, magnetic, and adhesive mounts. The Priority Command cabinet-mount intersection receiver installs inside the traffic signal controller cabinet. It can be secured to any flat surface in any orientation with two screws (recommended) or adhesive. It connects directly to the preemption inputs on most computer signal controllers. The external antenna can be installed using a through-hole surface mount in the top of the cabinet (recommended), adhesive, or a bracket mount. It is powered by a commonly available 12 Vdc wall cube adapter (included). Setup requires two simple steps. First is to set the DIP switches inside the case according to a chart for the intersection size, roadway speed limit, and yellow light time, and to enable or disable low-priority, 4-way-red, and around-the-corner preemptions. Second is to save the GPS coordinates for the center of the intersection from a Priority Command transmitter-equipped vehicle. 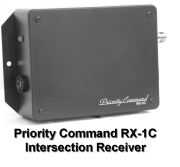 The Priority Command intersection receiver decrypts and processes GPS data from vehicles using innovative software to track the vehicle's position, speed, and heading and determine its authenticity and priority level. When the vehicle reaches the optimum distance from the intersection, the receiver closes one of four relaysdepending on the vehicle's direction of approachwhich in turn activates one of four directional preemption programs in the computer traffic signal controller. The signal controller immediately turns all green lights to yellow and then to red for all directions of approach except that of the emergency vehicle which is kept green or turned to green as soon as all other lights have turned to red. The signal controller may also be programmed to turn the lights red in all directions. In case two or more vehicles approach the same intersection from different directions, the highest priority vehicle will get the preemption, even if a lower-priority vehicle has already initiated a preemption from another direction. The Priority Command intersection receiver responds to an extended-range four-way-red preemption command from a vehicle by first increasing the preemption distance by 50%, and then, when the vehicle reaches that distance, closing a fifth relay. This causes the signal controller to change all green lights to yellow and then red in all directions. The signal controller is programmed so that preemptions always includes a normal yellow-light cycle. The preemption remains in effect until the emergency vehicle reaches the intersection. The preemption will also be canceled if the vehicle stops, moves away from the intersection, or stops transmitting. 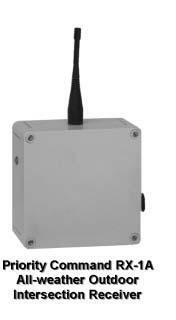 Installs quickly and easily inside the traffic signal controller cabinet. Uses commonly available 12 Vdc power adapter (included). Connects directly to computer traffic signal controller. Six preemption outputs: four for directional green, one for four-way-red, and one reserved for railroad preemption or custom-programmed, e.g., 5-way, intersections. Antenna options include through-hole surface mount in top of cabinet (recommend), adhesive, or bracket mount. Set the DIP switches according to a chart for intersection size, roadway speed limit, and yellow light time, and to enable or disable around-the-corner, 4-way red, and low-priority preemptions. Store the GPS coordinates for the center of the intersection. Non-volatile flash memory retains configuration data through power outages. Recovers in seconds after power is restoredno backup power required. Mounting hardware Flanges on back of case mount to any flat surface. Electrical connections +1224 Vdc, electrical ground, 6 preemption outputs, and logic common (not shared with electrical ground). The Priority Command RX-1A all-weather, outdoor receiver is identical in features and specifications to the RX-1C except that it is enclosed in a heavy-duty polystyrene case that meets NEMA 4X (IP-66) standards for water and dust resistance, and it includes a water-resistant "rubber ducky" antenna. It is designed to withstand the harshest weather conditions from sub-zero cold to desert heat, as well as wind, rain, snow, and ice. The RX-1A is ideal for controlling dedicated warning lights at uncontrolled intersections, driveways, and crosswalks or wherever there is no cabinet in which to install it. It operates on 1224 Vdc that can be provided from a number of sources. It can even use solar-charged batteries for locations where electricity is unavailable. The Priority Command RX-1A all-weather receiver combined with our traffic warning sign and solar-powered halogen-strobe beacon provides a complete wireless solution for remote installations. Just set the DIP switches, locate the center of the intersection, hang it up, and forget it. It uses commonly available motorcycle or snowmobile batteries which can provide years of maintenance-free service and can be replaced in minutes.